Hooray! it’s September and I’m now officially caught up with my bee blocks. August’s blocks were actually made after September’s but in the spirit of returning some structure to my increasingly hectic life, I’m at least going to blog about them in the correct order. Taking the lead last month was Mr. Shauan Abels who, for some months now, has been a honorary Brit, staying at an RAF base on military service. We’re hoping to meet up before he returns to the US at the end of this month and discuss all things quilt, Tula Pink and what really goes on in the navy! As has become tradition for the members of the bee, here’s a few tidbits about Shaun which, owing to his tardiness in replying, some of the other guys made up. 1. Shaun likes big butts and he can not lie. 2. His drag queen name is Dixie Normous. 3. His favourite pants are quilted leather assless chaps. 4. The real reason he moved to the UK was so that he could freely perform “Baby Got Back” as Dixie Normous, while wearing his quilted leather assless chaps. You should see his tip jar! 5. His favourite pick up line is “Helllllo, sailor!” It works. 6. His first real job was slinging chicken wings as a Hooters girl. He still gardens in his orange shorts. 7. He considers Tula Pink a personal hero, second only to Nicki Minaj. A little more interesting than the your usual bio, wouldn’t you agree? Don’t forget to check out Shaun’s work, including the progress on his Tula Pink City Sampler, on Instagram, where he posts as slabels. After a bit of a false start involving a copyright issue, Shaun scrapped his original block plans and made his month a free-for-all! Once again the choice was ours. We could make what we want, as long as it finished at 12.5″. I thought for quite a while about what to make before deciding that I wanted to incorporate two elements; one, Shaun’s love of Tula Pink and two, his association with the navy. 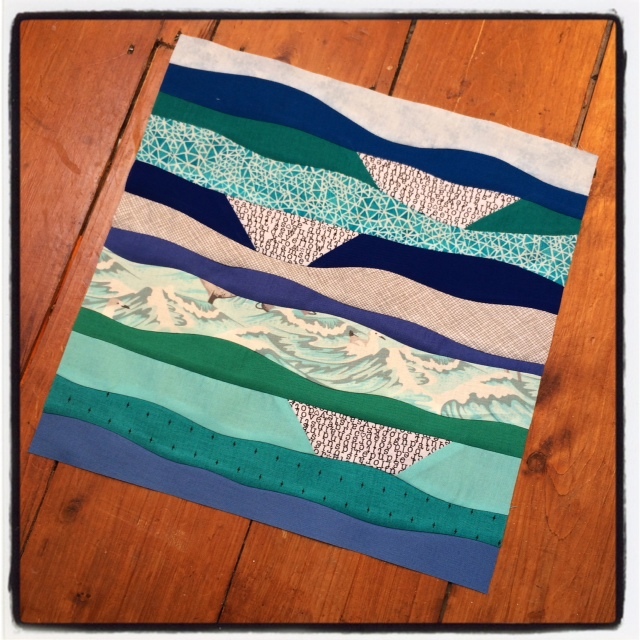 For my first block I went for improv curved piecing, using blues and greens to represent the sea. I fashioned some paper boats from a text print and scattered them upon the waves. I have a few ideas about future quilts that involve curved piecing so this was a good opportunity to practice. It went well, once I got into the swing of things, and wasn’t nearly as daunting as I expected. 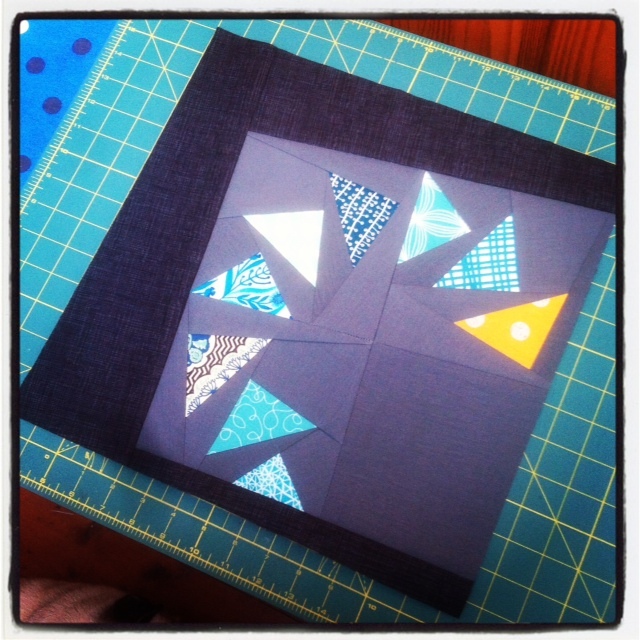 For block number two I used triangles as my inspiration after a comment Shaun had previously posted on my September blocks (coming soon!). 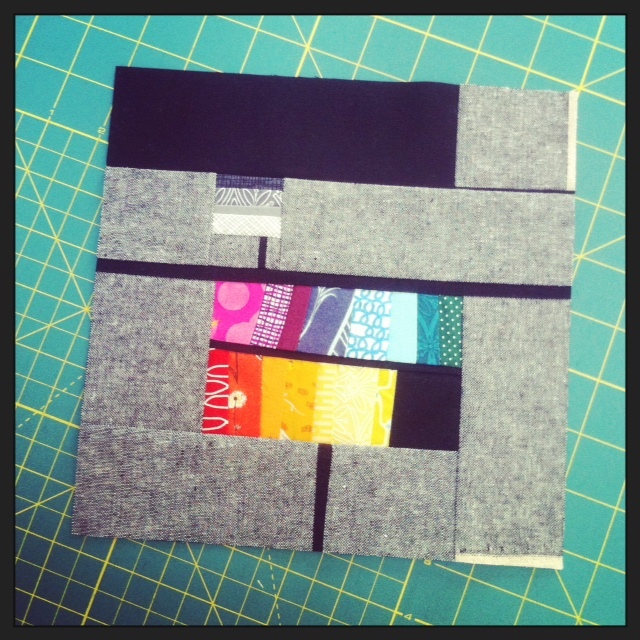 Again I couldn’t stay away from improv piecing, and really had no plan beforehand. 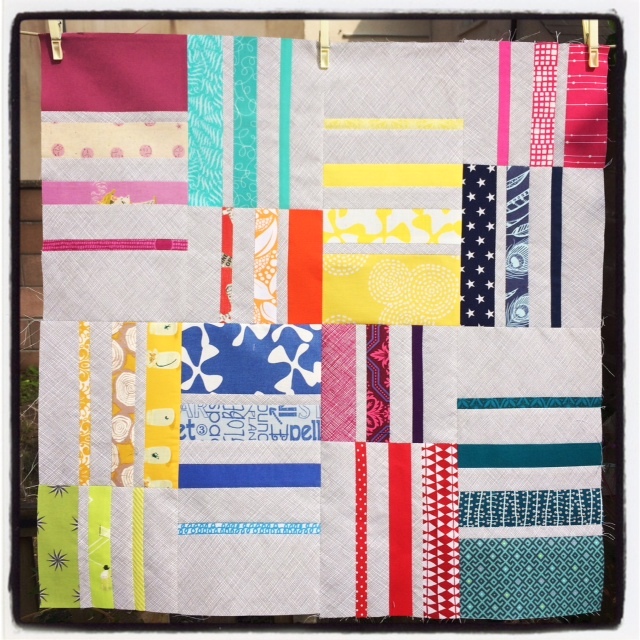 I chose some great Tula prints from her Accacia and Foxfield collections and mixed them up with some scraps of solids and co-coordinating prints. I love it when I get let loose with my block making and these two were great fun. There’s something about a quilt that has so many different elements coming together from so many creative minds that really excites me. I can’t wait to see this one finished! There’s only September’s block for me to tell you about before it my turn. How exciting! I’ve already let the guys now what I want so hopefully I’ll start to see the fruits of their creative labour on Instagram very soon. The bee hashtag is growing each day! Be sure to follow along on with #NGAQB. Quick, somebody call the police, because I have been robbed…of time! Where in the world did July go? Was it something I said? Please, come back! I swear I’ll be better, make the most of you and give you the attention you deserve…no…you’re truly gone and you really can’t turn back the clock? Damn! I can’t believe that we are over half way through the bee. I’m disappointed in my self that I’ve fallen behind, but hey, life’s an attention seeker. This weekend, having cleaned and re-organised the attic a while back, I was ready to jump back on board and tackle some of the guys’ blocks. technically I’m still behind, with July’s fabric still languishing in a pile, but for now let’s talk about Mr. June, AKA Chris Jones (a wonderful Welsh surname) and his block du mois. Chris was originally an extra member of the bee but owing to another member’s need to leave stepped up to take June. Like all the others, he gave the group this FAQ so that we might get to know him better. Read on! Do you have any nicknames, or go by any other name? I used to be heavy into online gaming (Everquest and World of Warcraft) so I have a few character names that people still call me. Typically, Chris is good enough to get my attention. I’ll answer to just about anything you call me though. Did you go to College? What did you study? I started college with the expectation that I would get a biology and chemistry degree, and move on to work in a hospital as a phlobotomist or in a research lab. I was three classes shy of my biology degree when I took a psychology class on a dare. That one class changed everything that I had planned for my life; I ended up graduating from college with dual degrees. One in Psychology with an emphasis in Depth and Archetypal psychology, and one in Sociology with an emphasis in Anthropology. One day I’ll make it back to school and get my Masters in counseling. I want to either be a licensed counselor, or teach psychology and anthropology on a college level. Right now I’m a SQL Developer/Data Administrator for an online book company (nope, not that one – not that one either). I’ve been with the company for fourteen years; I started with them two weeks after I graduated college. I started in the Customer Service department, and quickly moved up to CS Manager. I’ve held a position in just about every department within the company, and if I haven’t worked there, I work closely with them to generate reports or import data. I didn’t actually pick up quilting until I was in college and living with my mom’s family. She has a strong lineage of quilters, and I thought I might enjoy it. I grew up with my grandmother, who was a seamstress. She taught me how to sew, crochet, cross stitch, embroider and many other things. When I graduated from college, I stopped quilting for a while. I was sucked in to the world of MMORPG, and barely had time for anything else but work. 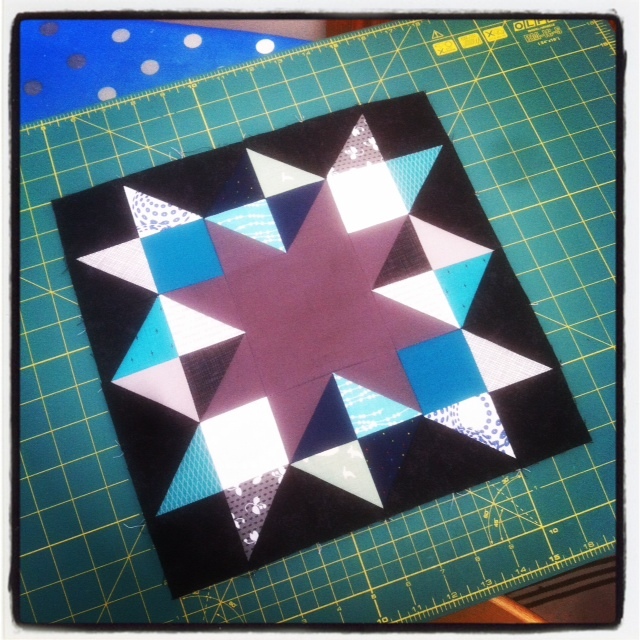 I picked up quilting again at the suggestion of a great friend at work. She introduced me to hand-piecing and I was in love again. I’ve done quite a few small projects, but I’ve yet to actually quit a top yet. I’m hoping that I’ll get to take some valuable time-off soon and try my mom’s new long arm or free motion quilting machines. Outside of sewing/quilting, I love to cook, can, and garden. I just picked up canning this year, and I love it. There’s nothing more awesome than taking the things that you grow and preserving them to eat throughout the year. Though I don’t typically eat it, I love making jam, the stranger the flavour profile, the more fun. So far I’ve made mulberry jam, strawberry balsamic jam, grape jelly, wild berry (strawberry, blueberry, mulberry) and apple butter. I’m trying out recipes for pineapple rum jam and mulled red wine jelly. They will likely be part of the family Christmas presents this year. Yep, I have three furbabies that are the love of my life. A scottie named Finnigan, a Cairn named Ursula and a German Shepherd named Zahara. Ursula and Zahara were both rescues. We’re currently taking Zahara through obedience school right now. Orange, definitely orange. From pumpkin to safety vest, I love it all. If you could pick your own name, what would it be? For a long time I wanted to change my middle name (no, I won’t tell you what it is, but if you guess correctly, I’ll let you know) to Xavier. I’ve always loved that name, and I’m not really sure why. Fall will always have a special place in my heart. I love the color of the season. But now, because I really enjoy planning gardens, and digging in the dirt, I’d have to go with spring. The smell of the air right after a spring rain….it’s invigorating. I’d love to see my grandfather again. He was such an amazing person. He was a short-order cook in the army, a recorded musician that wrote music, played the guitar, banjo and fiddle, and spent the greater portion of his adult life as a taxi driver. His routes ranged from around the block to across the country. He loved life, and never had a cross word for anyone. He, like my grandmother, really taught me how to “be” in this world and I love him for it. I’d love to see him again. I never know what to say with this question. I think the best thing that I can say is that my Meyer’s Briggs personality type is INFP. I’m introverted, usually very quiet and reserved, or in my own world. Feelings and emotions are important to me, and I am usually overflowing with them. I like to daydream, and don’t like strict rules. If you could be any fictional character,who would it be? I can’t narrow it down to one. I’d like to think that I’m equal parts Mindy Kaling, Aquaman, and Captain Jack Harkness in a candy-coated Lord John Grey shell. I probably have too many to mention here. I have a touch of an OCD streak that rears its ugly head from time to time. Right now the biggest thing that bothers me are leaves. I was out in the snow raking them the other day because I couldn’t stand seeing them all over the ground. As far as peeves from others, though, I don’t like people who use others for their benefit. Gets in my craw every time. Yep, I have a half-brother and a step-sister. Both are grown, though my brother still lives with our parents. I will listen to just about any type of music, except modern country. I just can’t get into it. As far as favourites…the sugarier the pop, the better. As of late I’ve been bouncing between Bollywood hits and electronica. Chris blogs at adandyman and is Kailichi on Instagram, Pinterest and twitter. For his month Chris choice a diamond stack block. I have to admit that when I first saw this I was a little worried. I mean come on, look at all that bias. In the end it wasn’t that bad, although my second block came out decidedly better than the first. Chris had no specific colour requirements, only that the first border around the diamonds be white, other than that, the crayon box was ours to command! I naturally gravitated towards my colours of teal, mustard and purple, throwing in some favorites such as an Architextures crosshatch and some Tula Acacia Foxfield. Though I bitched at the beginning, these weren’t that bad to make and I think I’d happily do them again…maybe…with wine…and hard liquor. The #NGAQB hashtag is blooming now, so be sure to check out all the marvelous male-made things. Also, I think we’re going to have our first completed quilt top soon. Mr.January, Sandy, has finally gotten around to making his last few blocks. Yay! It’s always the way! You let yourself get comfortable, throw around a little swagger and cockiness, and before you know it April’s been and gone and your bee blocks aren’t done! Time really did catch up with me last month. What with work and all the little side projects I had going on it was inevitable that some plates wouldn’t get spun. Fortunately, the situation has been rectified and I’m back on track, having posted out April and May bee blocks yesterday. Phew for a little breathing space! When the #NGAQB started to take shape many moons ago, I was excited about all the new male quilters I’d get to meet and interact with. It was like being invited to an exclusive club, where Facebook was our smoking room and we talked fabric rather than finance. I had that new-boy-in-the-class feeling as I wasn’t familiar with any of the group, except one, Mr. April and the Quilt Dad himself, John Adams. When I began quilting, Quilt Dad was a shining beacon. He held my hand and guided me through the construction of my first quilt, for which I used his awesome wonky log cabin tutorial. That quilt was the first I saw through to the end and would never have been as good if it weren’t for John’s informative and easy-to-understand instructions. I’m sure that John needs no introduction to many of you quilty folk out there but as per tradition, he took a few moments to share some of himself with the group. “I am a father of three, originally from Brooklyn NYC but now living in the Raleigh-Durham area of North Carolina. I live with my 9 year-old twin girls, my 8 year-old son, and a crazy German Short-haired Pointer named Bristol. Though I often wish it could be, quilting and pattern-writing is not my full-time job; by day, I lead branding and brand marketing efforts for a global software company. 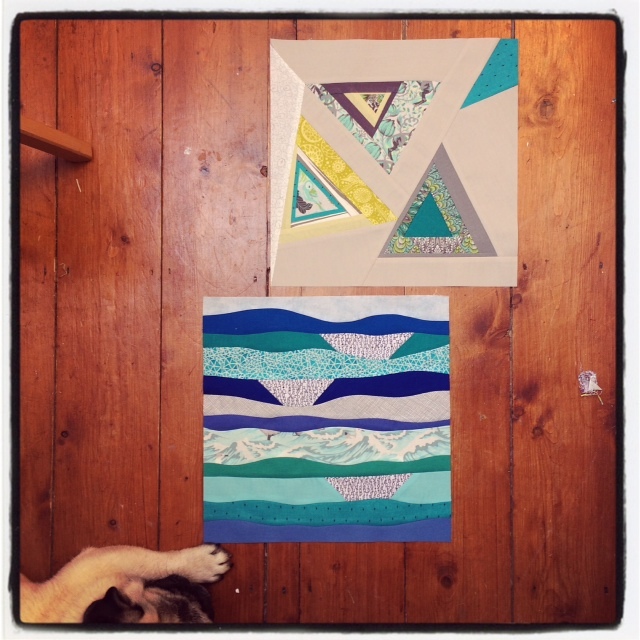 I am a completely self-taught quilter (thanks, blogs and internet!) and have been sewing for about 7 years now. I earned my undergraduate and master’s degrees at the University of North Carolina and, when I’m not sewing, enjoy cheering for the UNC Tar Heels. I was originally inspired by the blossoming worlds both of craft blogging and modern fabrics back in 2004. I was living in Charlotte NC at the time and began mixing and matching fabrics and buying fat quarters in my local quilt shop even before I knew how to sew a stitch. I was really drawn to the creative process of mixing and matching colors and prints. That was when Amy Butler’s Lotus line had just come out, and the options for bright modern fabrics was growing like crazy. Before long, I decided I was going to make a quilt and read free tutorials online until I felt comfortable with the basics. 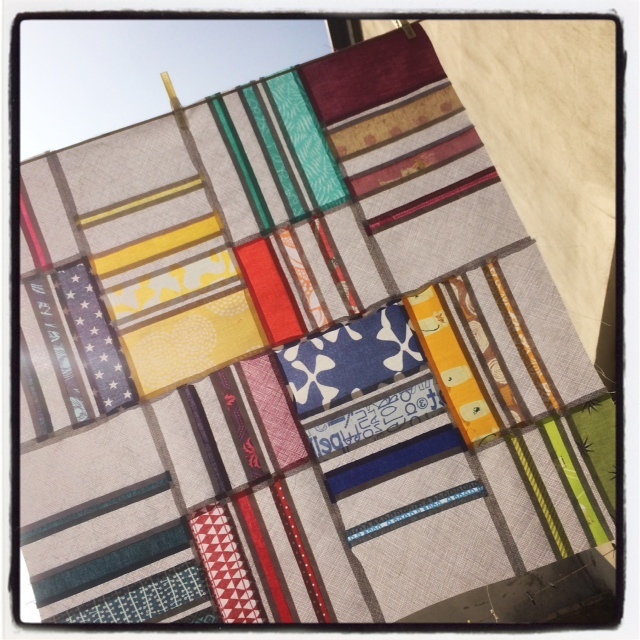 I started my blog, QuiltDad.com, in 2008 on a whim, mainly to be eligible to join a swap at the time but ultimately to share my love of patchwork with others. Since then, I’ve remained very active in online quilting communities through swaps, virtual quilting bees, and guilds. Today, I try to apply my own quilting aesthetic to designing original quilt patterns for both fabric designers and companies and frequently contribute to creative blogs, books, and other collaborative endeavors. I’ve contributed to several collaborative quilt books, have two book titles of my own (Pretty in Patchwork: Holidays and the soon to be released Beyond Neutral: Quilts Inspired by Nature’s Elements) and was a co-founder of the popular e-magazine and book series for modern quilters, Fat Quarterly. As he mentioned, John can be found blogging at Quilt dad and on Instagram as j_q_adams. 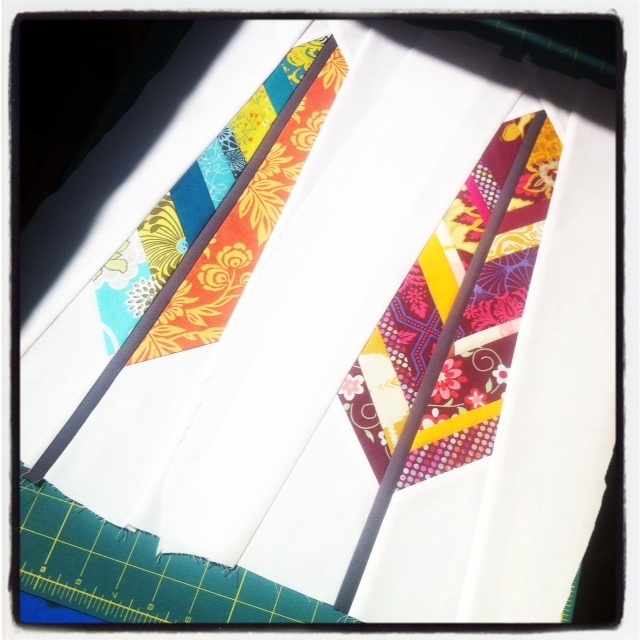 John requested feather blocks for his month, based on a pattern by Anna Maria Horner. Print and colour were pretty much left up to us. Aside from no novelty fabrics, we had a free reign. I was guided by John’s love of pattern and chose floral and geometric prints in bright, saturated colours by Joel Dewberry, Amy Butler, Tula Pink and, of course, Anna herself. I strayed from the instructions a little as I didn’t want all my feathers to be the same. 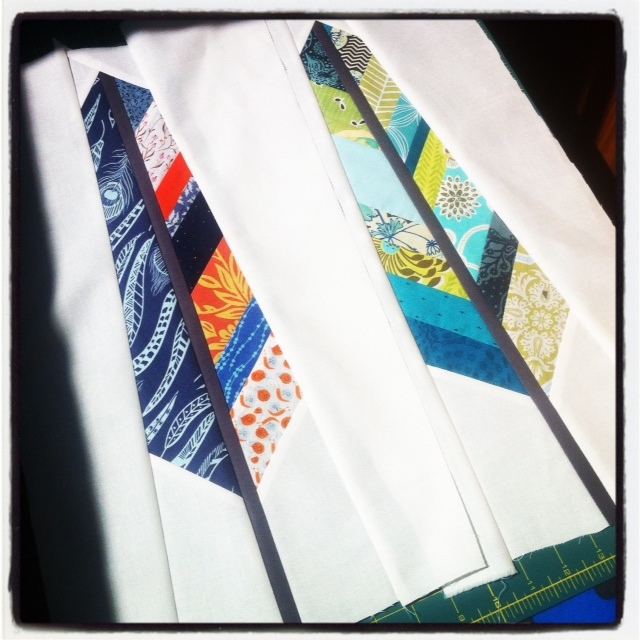 So, rather than sew long strips as per the instruction, I made smaller strip sets in different fabrics. I really liked making one side of the feather in one piece to offset the balance. I went for a warm grey for the feather quills and the background was Kona Snow, as per John’s request. I went through an emotional roller coaster when I made these. One minute I loved them, the next I wanted to fling them from the roof. ! Now that they’re done I can confidently say that I love them. I think I’ve been bitten by the feather bed bug! For anyone else attempted these my advice would be gentle, gentle! The bias is prone to stretching so go carefully with your iron. You may also want to over shoot the background, as I have done. That way you’ll have some leeway to square up and ensure all your blocks are the same size. I love this bee a little more with every new block I make. The group is made up of such inspiring, dynamic men and I can’t wait to get some of their handiwork fall through my letterbox come October. Remember to follow along using the hashtag #NGAQB and I’ll be back soon with Mr. May. Yes we are, with tea! Andrew shares his awesomeness as Testostersewn on Instagram. For his month, he chose an Inverted Star block. We were asked to keep the star solid and the exterior pieces either solid black or a black tone-on-tone print. As for colours, we were guided by a photograph Andrew shared with the bee. I have to admit that I didn’t realise the photograph had a significance to Andrew until after I made his blocks. I feel so privileged to have contributed to something that will stir great memories. Whilst I enjoyed making these blocks I don’t mind saying I was a little anxious beforehand! After reading through the pattern several times, I ultimately decided to ignore it! Whenever I’ve made half square triangles in the past, my go-to method has always been to stitch either side of a line draw on a square and cut in half. 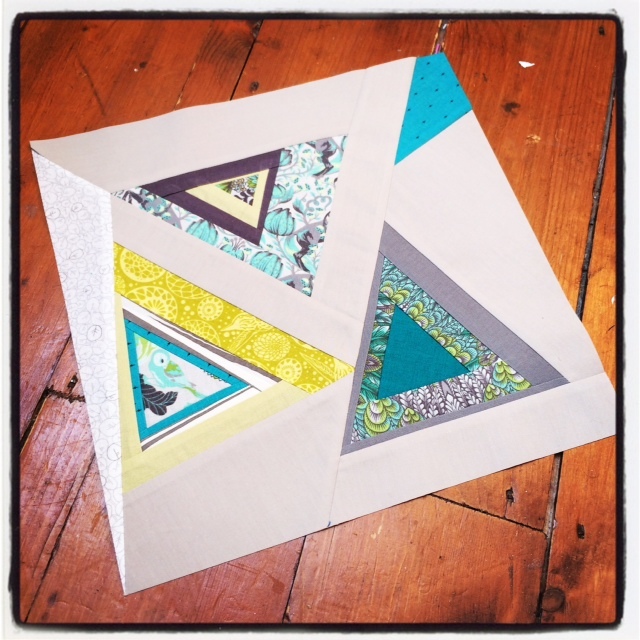 The pattern called for triangles cut first then stitched together. Well, I guess cutting on the bias is my bronchitis, coz I ain’t got time for it! Instead, I made over-sized units and cut them down in an attempt to improve the accuracy of my piecing and have the block come out the right size. 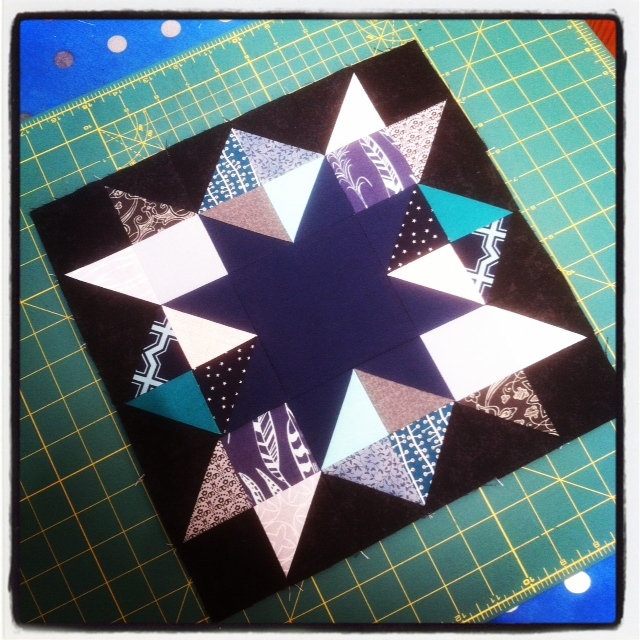 There were a lots of pieces in this block and I didn’t want to lose too much of it! I fastidiously sewed each seam with a scant quarter-inch allowance and went softly, softly with my iron. Distortion I did not need! Thankfully when it came to measuring up, the blocks were the size they were suppose to be, give or take a few threads. The photograph allowed for a great colour palette; lots of moody blues and greys with hints of whites and marine greens. I had no shortage of fabric to choose from as these are the colours I love to work with. 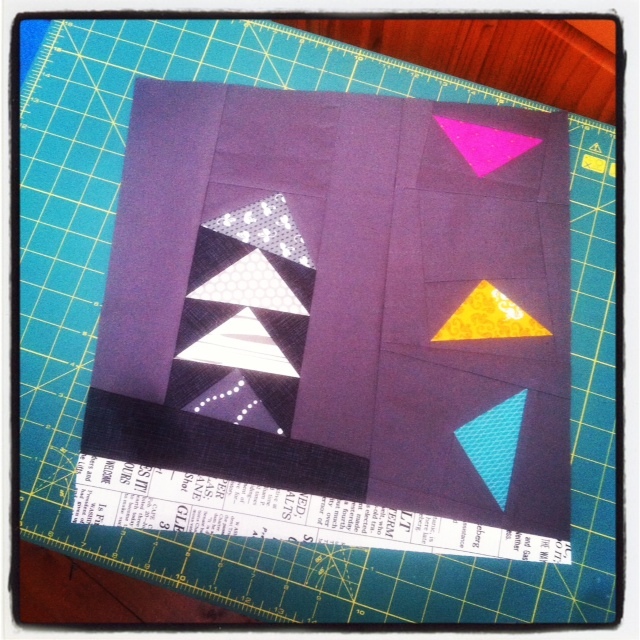 I used a mixture of prints and solids and tried to varying their position over the two blocks. I’m particularly proud of the fussy cutting I did on the Joel Dewberry print in the first block. I really wanted the pattern in exactly the same place and I think I nailed it. A small victory in a long-fought battle against steam and seam! Such sentiment! Three months in and I’m loving every minute of this quilt bee experience. Sharing my creativity with such a great bunch of guys is so rewarding, I wouldn’t even if I didn’t have a month of my own…actually, scrap that, roll on October, it’s ours and we wants it! As always, follow along on Instagram with the hashtag #NGAQB. As well as the torrential rain and icy winds that have assaulted much of the UK, February also brings with it the second month of the #NGAQB. It seems like only yesterday that me and my fellow bee mates were in the planning stage; assigning months and getting to know each other in the virtual space of our Facebook group. I guess then that time really does pass quickly when you’re having fun, and even quicker when you’re having bucket loads of it. February sees the first of our group’s two Andrews take the quilting compass and direct us towards gaggles of flying geese amid negative space. During their month, the bee members share a little of their history with the group. As it happens, Andrew too has an affinity for all things Japanese. One of the things I like best about the bee is hearing how the other members came upon their quilting journeys. As well as his blog, you can check out Andrew’s work on his Flickr feed, and by following him on Instagram (andrewjoslyn) and Twitter (andrewjoslyn). For this month we were asked to make blocks that incorporated flying geese of any size and colour into neutral negative space. Recently, negative space has become my mot du jour and I love experimenting with it. For Andrew’s first block, I wanted curved flying geese. 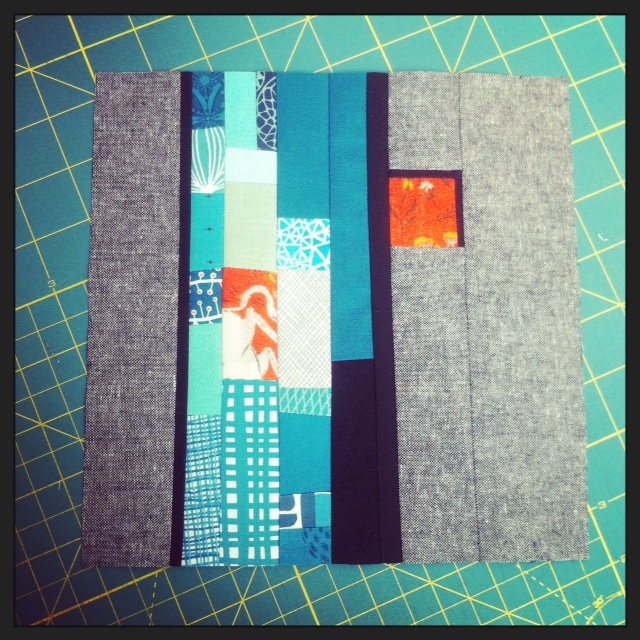 Those of you who follow me on Instagram may remember and episode of intense panic when I made this block. You see, my original plan was to have the geese set amongst the grey fabric without the black sketch border. A miscalculation in size led to some improvised splicing and this was the end result…better than anything I had previously envisaged. The whole incident inspired this post, where I learned to embrace mistakes and roll with the punches dealt to me by too-short fabric pieces and misaligned seams. For the second block I was interested in addressing a theme that had risen it’s rather ugly head a few weeks ago. Anyone who follows the #NGAQB may be familiar with an accusation of sexism that came about due to the naming of our bee. I won’t dig up all the details again here but the incident inspired me to create a block that showed whilst we embrace our differences as male quilters, we will always have utmost respect and appreciation for the female quilters who came before us. I wanted the block to be a fun and mischievous interpretation of breaking the mould and embracing change. I’m so happy with both of these and had such great fun making, even if I did get a little stressed with the first! They’ve already been posted and should arrive with Andrew soon! I can’t wait to see the others. Mr. January has almost received all his blocks and I can tell you know they look awesome together. Make sure you keep up-to-date by following along with the hashtag #NGAQB on Instagram and Twitter, or click on the badge in the sidebar to link to the Flickr page.